Semiconductor Engineering - Semiconductor M&A? Semiconductor Engineering - Semiconductor M&A? Home > System-Level Design > Semiconductor M&A? There is some activity finally, but we’re certainly not out of the doldrums yet. Last week a friend of mine was giddy with joy as he exclaimed, “Semi M&A is back!” It seems Qualcomm’s acquisition of Atheros and Intel’s acquisition of Silicon Hive somehow changed the chemical makeup of his brain, transforming him from an eternal semiconductor market pessimist to a born-again optimist. 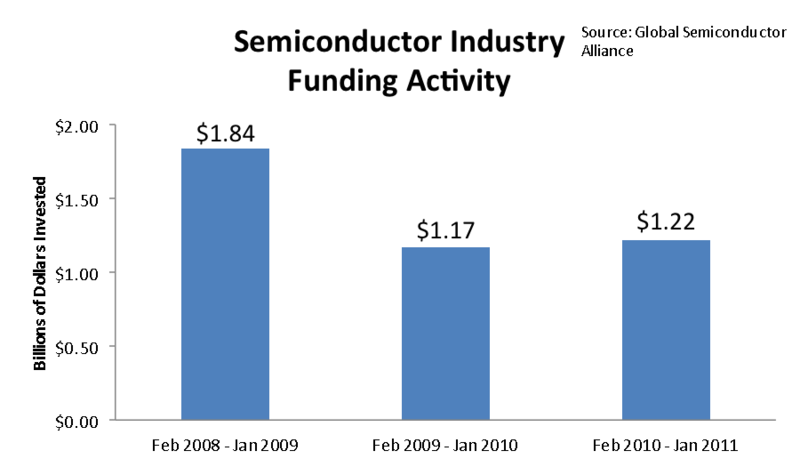 Being someone who lives and dies by data, my initial response was, “Let’s see the data.” And yesterday that data arrived: The Global Semiconductor Alliance’s “Jan 2011 Global Semiconductor Funding, IPO and M&A Update” entered my Outlook inbox and I’ve had some time to chew on it. Bottom line: Carry on. There’s nothing here to be excited about. 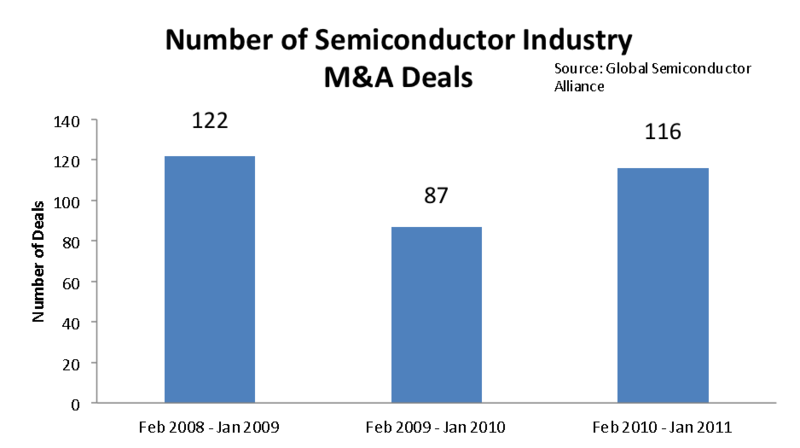 The number of semiconductor M&A deals was 33% higher between February 2010 and January 2011 than the previous 12 months. However, that’s not saying much after a dismal 2009 where M&A deals dropped 30% from 2008. Another way to look at the health of semiconductor innovation, and often a leading indicator of semiconductor market performance, is to look at the amount of funding being given to private companies. Here the story is even worse: $1.22B was raised between February 2010 and January 2011, vs. $1.17B the 12 months prior and a whopping $1.8B between February 2008 and January 2009. The good news is that the investments and acquisitions being made today seem to be offensive in nature, where companies are investing at a premium in new capabilities and new markets with the goal of growing their companies. This contrasts with previous years’ slew of defensive investments and acquisitions, where the goals were cost cutting and picking up technology or engineers on the cheap. So am I excited? No. But at least I’m paying attention to the M&A market again. That’s at least a step in the right direction.